A delicious fruit scone is an ultimate treat at any time of say and, of course, are the quintessential part of a traditional afternoon tea. Fruit Scones can be eaten hot but not straight from the oven; they will need to cool slightly. Alternatively, they are also good served cold and always best eaten fresh. Homemade scones will keep for a day or two in an airtight box, but once kept warm through before serving. They also freeze very well. The success of the perfect scone depends on working as quickly and as lightly as possible, keeping all the ingredients as cool as possible. 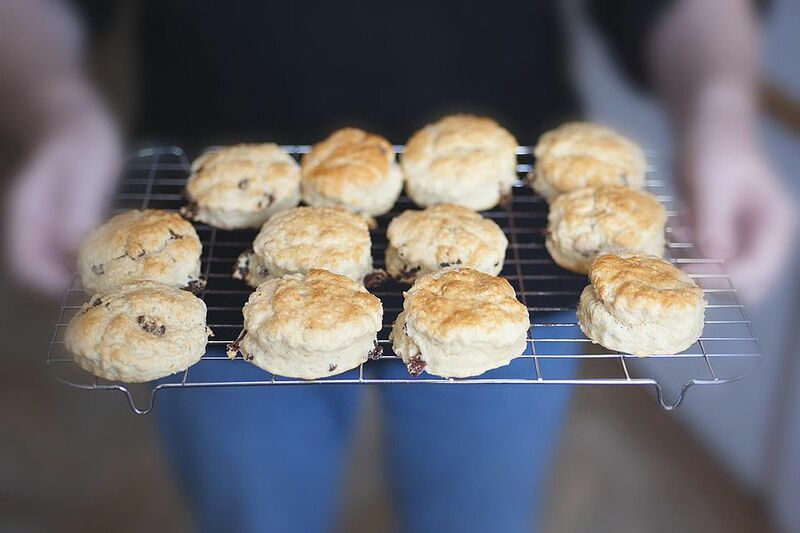 To make sure your scones are light, fluffy and well risen you may like to have a look at these simple tips for making the perfect scone, the tips apply to fruit as well as plain or cheese scones. Sieve the flour into a roomy baking bowl, add the cubed butter, the baking powder and salt. Quickly rub the butter into the flour your fingertips until the mixture resembles fine breadcrumbs. Work quickly so the dough does not become heavy. Add the sugar and the dried fruits, mix well. Make a well in the center and using a dinner knife, stir in enough milk to make a soft, pliable dough. If the dough is too sticky sprinkle with a little flour. Turn the mixture on to a floured board and knead very lightly until just smooth then lightly roll out to 2cm / 3/4" thick. Cut rounds with a 7.5cm /2" cutter or cut into triangles with a sharp knife. Serve with butter, or lashings of jam and cream. Delicious. Remove the dried fruit from the recipe. Omit the dried fruit and add 55g (1/2 cup) grated cheese and 1/2 teaspoon dry mustard powder to the mixture after rubbing in the fat and flour and continue with the basic recipe. Sprinkle the scones with 55g (1/2 cup) more grated cheese before baking the scones in the oven. Quick, Easy, Nutritious. Red Lentil & Tomato Soup What's Not to Like?